Following the first half of Arrow's midseason finale last night, "The Scientist", the CW Network has released a promo for the second half, "Three Ghosts", airing Wednesday, December 11 at 8 PM ET. Grant Gustin returns as Barry Allen, who grows closer to Felicity (Emily Bett Rickards). 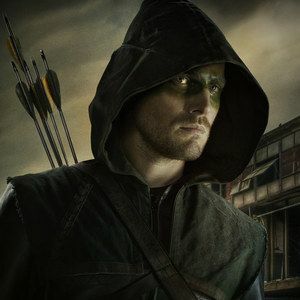 Meanwhile, Oliver Queen (Stephen Amell) does battle with Brother Blood (Kevin Alejandro) and discovers his identity has been compromised. You won't want to miss the final Arrow episode of 2013 next week. After a fight with Cyrus Gold AKA the Acolyte (guest star Graham Shiels), Oliver is drugged and left for dead. Determined to cure him, Felicity makes a risky decision. The cure causes Oliver to hallucinate, and what he sees forces him to confront his past. Meanwhile, Barry (guest star Grant Gustin) continues to help Felicity, and their connection grows stronger. The Arrow asks Lance to look into Gold, but when the stakeout on Gold goes bad, someone is killed. Roy is captured and tortured by Brother Blood (guest star Kevin Alejandro).